CalvertHealth offers diagnostic and rehabilitation services for cardiac patients. We work collaboratively with Washington Hospital Center, the University of Maryland Medical Center and Adventist Healthcare to ensure coordination and continuity of care between the tertiary medical centers and CalvertHealth so our patients can be assured the best treatment, close to home. Cardiology services are available Monday-Friday, 7 a.m. - 3 p.m. To schedule an EKG, echocardiogram and/or stress test ordered by your doctor or provider, call the Patient Access Scheduling Center at 410-414-APPT (2778). CalvertHealth's Anti-Coagulation Clinic helps patients on blood thinners like Coumadin manage their medications. Regular monitoring is very important for these patients because when used incorrectly or without regular blood tests, anticoagulants can cause serious side effects. Too much can cause patients to bleed more easily and too little can put patients at risk for forming clots. At the clinic, patients can have their blood drawn, get their results immediately and a pharmacist or nurse practitioner can adjust the dosage if necessary and answer any questions. The Anti-Coagulation Clinic is located in the Calvert Medical Office Building (MOB), Suite 302 A, on the main hospital campus in Prince Frederick. It is open Monday through Thursday from 9 a.m. - 4 p.m. and Fridays 9 a.m.- 3 p.m. Appointments are necessary. Most insurance plans cover this service and a physician referral is required. A cardiac catheterization (cardiac "cath") is a procedure designed to evaluate the condition of the heart muscle, the heart valves and the coronary arteries. During this procedure, the physician inserts small tubes (catheters) into arteries, veins or both, and then guides them into the heart chambers. The pressure and oxygen in the chambers are then measured and X-ray pictures of the chambers are taken. This part of the test allows the physician to evaluate the heart muscle and heart valves. The second part of the procedure, called the coronary angiogram, is the part designed to evaluate the coronary arteries. Contrast material (sometimes called dye) is injected into the openings of the arteries while taking X-ray pictures. This allows the doctor to see the exact size and degree of blockage in the arteries. Some catheterization labs also provide therapeutic procedures. At CalvertHealth Medical Center, we offer diagnostic cardiac catheterization with a physician's referral. Many catheterizations are needed only for diagnostic purposes. Your physician can help you decide if a catheterization at CalvertHealth is right for you. The heart is made of muscle. The blood from the heart carries oxygen to all parts of the body. The blood vessels, called arteries, carry the oxygen-rich blood. The job of the heart is to pump blood throughout the body. The heart needs its own oxygen supply to survive. When the heart works hard, it needs a larger supply of oxygen. The heart has four chambers. The atria (upper chambers) receive blood into the heart. The ventricles (lower chambers) pump blood out of the heart. There are four valves in the heart. The valves act as one-way doors to keep the blood flowing in the same path. The septum is a wall that divides the heart into right and left sides. The right side of the heart receives oxygen-poor blood from the body. The oxygen-poor blood is then pumped to the lungs. While the blood is in the lungs, it picks up a new supply of oxygen. The left side of the heart receives oxygen-rich blood from the lungs. The oxygen-rich blood is pumped to the body by the left ventricle. The aorta carries the oxygen-rich blood out of the heart from the left ventricle. The left ventricle does most of the heart's pumping work. The heart receives its supply of oxygen-rich blood through the coronary arteries. The coronary arteries lie on the surface of the heart. Coronary artery disease (CAD) is caused by atherosclerosis (also called "hardening of the arteries") by plaque building up on the lining of an artery. Plaque is a waxy substance made of cholesterol, fibrin, and calcium. Coronary artery disease can be an ongoing, progressive disease. As more and more plaque builds up in an artery, partial or total blockage of blood flow in the artery will occur. Atherosclerosis can occur anywhere in the coronary circulation. Symptoms of CAD result from a shortage of blood flow to the heart muscle. The most common symptoms of CAD are chest pain, chest tightness, chest pressure or shortness of breath. How do you develop CAD? Several risk factors (see below) have been identified that influence CAD or at what rate it develops. The more risk factors you have, the greater your chance for developing heart disease. A heart attack is also known as a myocardial infarction (MI) or a coronary. The heart must have oxygen to survive. Plaque (waxy substance that builds up and clogs the arteries) prevents the blood from carrying oxygen to areas of the heart muscle. When the oxygen supply to an area of the heart muscle has been stopped for a period of time, permanent damage results.This permanent heart damage is called a heart attack. Uncomfortable pressure, fullness, squeezing or pain in the center of the chest, lasting more than a few minutes. Pain spreading to the shoulders, arms, neck, jaw or back. Chest discomfort with lightheadedness, fainting, nausea, sweating or shortness of breath. Eat healthy, low-fat meals. Lose weight if needed. Take your medications as prescribed. Preventing cardiovascular problems upfront is always the easiest cure! We are here to help you make simple lifestyle changes that can have a big impact. Our classes and screening programs will help you learn to eat healthy, exercise, quit smoking and successfully manage your personal heart disease risk factors. For more information about our screenings, classes and programs, call 410.535.8233. The TLC (Therapeutic Lifestyle Change) exercise program is designed to meet the needs of individuals who have medical conditions such as heart disease, arthritis, diabetes, obesity, high cholesterol and high blood pressure. After obtaining your physician's consent, our certified trainers will measure your fitness level* and develop a realistic exercise program for you. The hours of operation are Wednesdays & Fridays from 9:00 a.m. - noon. The cost is $25.00 per month. We are located in the Cardiac Rehabilitation Center on the outpatient concourse of the main hospital. Please call 410 535-8233 to register. *A fitness assessment is required prior to beginning program. CalvertHealth offers comprehensive cardiac rehabilitation. Medically supervised, monitored progressive exercise training teaches you how to exercise safely, improve cardiovascular endurance and stamina, increase muscle strength, and improve joint flexibility after a cardiac event. We also provide education and counseling about your heart condition and how to modify your risk factors to decrease your chances of another cardiac event. Cardiac Rehabilitation is available Monday, Tuesday, and Thursday from 7-11 a.m. Most insurance plans are accepted. Call 410.414.4821 for more information. If you have an order from your doctor or provider and you need to schedule rehab services, call the Patient Access Scheduling Center at 410-414-4821. Being short of breath is a horrible and scary feeling. In fact, to prevent it, people often avoid physical activity leading to a further decline in their overall health. Pulmonary rehabilitation can help with this. Through medically supervised monitored progressive exercise and breathing retraining, participants gain the strength and confidence to perform daily activities-like taking a shower, cooking or shopping. Anyone who has been diagnosed with chronic obstructive pulmonary disease (COPD), emphysema, chronic bronchitis, asthma, cystic fibrosis, sarcoidosis or another lung disease can benefit from our program. It can also help lung transplant and lung reduction candidates. Patients are accepted into the program only when they can safely benefit from the exercises and instruction. Speak with your primary care physician to determine if you are an appropriate candidate for pulmonary rehabilitation. Research shows that pulmonary rehabilitation has been effective in reducing hospitalizations, improving quality of life, decreasing anxiety and depression, as well as fostering self-reliance and independence. As you exercise your upper and lower body, your muscles are able to use your lung capacity more efficiently. Many are able to once again enjoy activities with family and friends like eating out or going to a movie. Your pulmonary rehab team includes a medical director, a registered nurse trained in pulmonary rehabilitation and a certified respiratory therapist. Also, available to answer questions and provide support are a registered dietitian, pharmacist and social worker. Your initial visit includes a one-on-one evaluation and a short walk that enables us to determine your individual needs. Each pulmonary rehab session lasts about one hour and consists of aerobic exercise using various pieces of equipment. While you exercise, our staff monitors your blood pressure, heart rate and oxygen saturation. Patients typically attend three times per week up to 12 weeks. When you graduate, we can help you plan a program to do at home to maintain your progress. It is never too late to improve. Pulmonary rehabilitation benefits a wide range of patients. Our program is individually tailored to each participant's needs and abilities. Pulmonary rehabilitation is designed to control your breathing instead of your breathing controlling you. Pulmonary Rehabilitation is available Monday, Tuesday, and Thursday from 12:30-3 p.m.
For more information, call 410-414-4527. 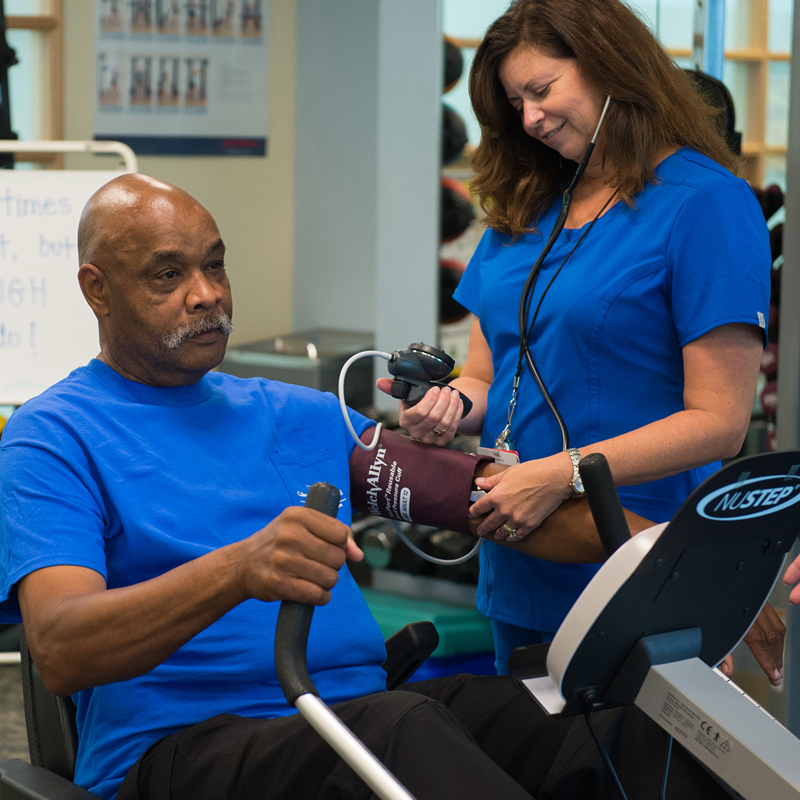 To schedule an appointment with our pulmonary rehabilitation clinic, call 410-414-APPT to schedule your cardio-pulmonary outpatient service, call 410-414-APPT. Our respiratory therapists are qualified to treat a variety of chronic and acute respiratory conditions for both inpatients and outpatients. The department is staffed 24 hours a day, 7 days a week by licensed/registered therapists. Therapists work with the Emergency Department to facilitate timely treatment and education of asthma and COPD patients. To schedule your cardio-pulmonary outpatient service, which includes pulmonary function tests, 6 minute walks and arterial blood gases, call 410-414-APPT. To contact the clinic call 410-535-8340. Cardiopulmonary is located on the first floor of the main medical center.